"HARRY POTTER & THE SORCERER'S STONE"
Chris Columbus knew this movie would seen on video far more times than in the theater and shot accordingly. It shouldn't lose much entertainment value when shrunk to fit your TV. Another entertaining but unnecessary scene involves a giant CGI-rendered troll storming around the Hogwarts School of Witchcraft and Wizardry until it's knocked out cold with a spell cast by Harry (Daniel Radcliffe) and friends. So much screen time is burned on these passages -- and on trumpeting a red herring bad guy (Alan Rickman in the singular great performance as a sinister potions professor) -- that the story suffers and the real antagonist is almost entirely absent from the film until the finale. Admittedly, Columbus ("Mrs. Doubtfire," "Bicentennial Man") goes through such motions with great panache. "Harry Potter" is a very glossy and exuberant adaptation of J.K. Rowling's smash hit novel about an orphaned young conjurer, raised by his cartoonishly cruel aunt and uncle until he's whisked away to Hogwarts to begin his education in the dark arts. Once the magic begins, the picture has an infectious charm as unassuming Harry learns he's a legend in the parallel world of witches and wizards because the evil warlock that murdered his parents (who were wizards as well) was unable to kill baby Harry. The warlock's powers were consumed in the attempt and he mysteriously vanished, but not before leaving a lightning-bolt scar on Harry's forehead. Harry receives his invite to Hogwarts via carrier owl (several carrier owls, actually, since his anti-magic guardians keep tearing up the missives) and is soon accompanied by burly, bearded, friendly giant Hagrid (Robbie Coltrane) to a London's Kings Cross train station. There he passes through a brick wall between boarding platforms and finds himself in another world. Once at school, befriended by fellow wizardry students Hermione Granger (Emma Watson, who steals scenes as the story's adorably brash bookworm) and redheaded Ron Weasley (Rupert Grint), who gets picked on for wearing hand-me-down cloaks. Their arrival at Hogwarts provides the movie's best moments of wonder, as the campus is a spectacular castle outside and in. Enormous gothic halls are lit by clusters of candles that magically float in mid-air and contain paintings that come to life and staircases that arbitrarily detach from their moorings and change destinations. Fan-satisfying trivia is established in nifty scenes like Harry's shopping trip to acquire his first magic wand, which he's told has a mystical connection to the wand of the evil warlock. But there's rarely any follow-through on such particulars -- in fact, Harry uses his wand a couple times but never speaks of it again. The movie is so busy being loyal to the minutiae of the novel that it's at least an hour into the 2-hour, 32-minute run time (what kid will sit still that long?) before the Sorcerer's Stone of the title is even mentioned ("Finally some plot!" I wrote in my notes). This gemstone holds the power of immortality and it's being guarded in the bowels of the school by a 20-foot tall, three-headed attack dog called Fluffy. "Harry Potter" suffers most from the fact that Columbus hardly takes time to flesh out his characters. 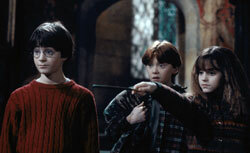 Of the three lead children, only Hermione has a distinguishable personality. Daniel Radcliffe shows a lot of dash as brave but unsure, bespectacled young Harry. But he's a bit of a blank slate and we never see him actually learning any magic or honing his skills (which, for some reason, he never remembers to use when he's in danger). Columbus expects us to just take it as read that he's naturally adept at such things and fast-forwards to more chapters of requisite stage business. Harry Potter fans at the preview I attended seemed to enjoy the picture's attention to detail and came away generally pleased. I must admit I was never bored, but I came away feeling as if I'd just watched a long-winded version of the novel's Cliff's Notes -- not a fully fleshed-out version of book so vivid and wonderful that it's enamoured post-MTV children to want to read again.